I love color. I am drawn to it on magazine covers, store displays and friend's bright beautiful homes. I adore fuschia on toes, a charming orange in a bracelet and my favorite shade of blue is the shade of my three year old's eyes. What I am afraid of is overdoing it. To be a walking faux pas of too many colors happening at once. An underlying fear of blinding someone's eyes with bold attempts of brightness. Or transforming something classic to the shade of the sun and have it turn out like something that should have never had a date with paint. Sometimes you just have to live out loud. 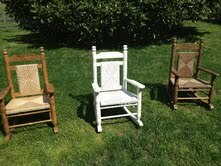 So here is my reinvention of some classic children's rocking chairs. They were a gift from my mother-in-law to my children so I asked for permission first (okay, truth be told I asked begged for permission after it was too late but she is so fantastic I figured she would say yes or I would be hauling it to the nearest Cracker Barrel to get three classic ones again). She said absolutely paint away. Guilt lifted. Paint resumed. These pictures probably don't quite do the stains justice but they were marked beyond any type of cleaning could do. Believe me I tried it all (and had the chair sitters try too). Okay spray paint we will make a date. I highly recommend painting something for children first. They are born non-judgemental, forgive flaws and will think anything is amazing if it comes in their favorite color. Note to self: next time paint in a spot that it won't be so noticeable that the grass will be smurf colored. Here is what I used and it did take about a can per chair. No, I did not have enough to do a second coat or to touch up the legs and missing spots. I highly recommend buying more than you need and picking up some clear gloss spray polyurethane to keep those chairs looking shiny and joyous. I don't think I really even need to provide instructions, that really is all there is to it. 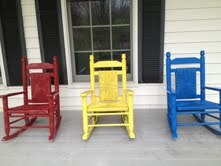 The most time consuming part was the drive to the hardware store (or in my case two trips to get more paint). I didn't sand first and just rolled with the natural imperfections but it's really a matter of personal preference and what type of condition your "before" project is in. It met all my expectations in a home project: simple, inexpensive and happy on the eyes. I think I may just become a spray painting monster. Those graffiti artists are really onto something. Brilliantly Bright and Beautiful! Kyle and I used the same type of paint when we bought an unfinished shelf to hang in our son's room. We wanted it to match the dark cherry wood finish, but without all the hassles and steps of stain and polyurethane. This gets it in one shot, so even if you aren't looking for BRIGHT and want a wood stain finish, you can do that too!!! Love it!!! These are so much fun! I've often skipped the whole sanding and priming thing, too. Glad it worked out for you!